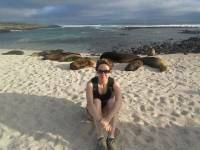 In November 2012 I got very sea sick on a Galapagos cruise with G Adventures. The waters in the Galapagos aren’t rough, but I had trouble anyway. I guess it was because of the small size of the boat and its tendency to roll in many directions. They put me ashore in Puerto Ayora and I quickly recovered. When the tour came through a day later, I tried again but I got sick again. Luckily, they were able to put me ashore again on Santa Cruz and I made my way back to Puerto Ayora again. I had a wonderful time hanging out in my Puerto Ayora Visit and enjoying the hospitality of the friends I made in this special town. Just over 10,000 people live on Santa Cruz Island. Most of them live in Puerto Ayora at its southern end. 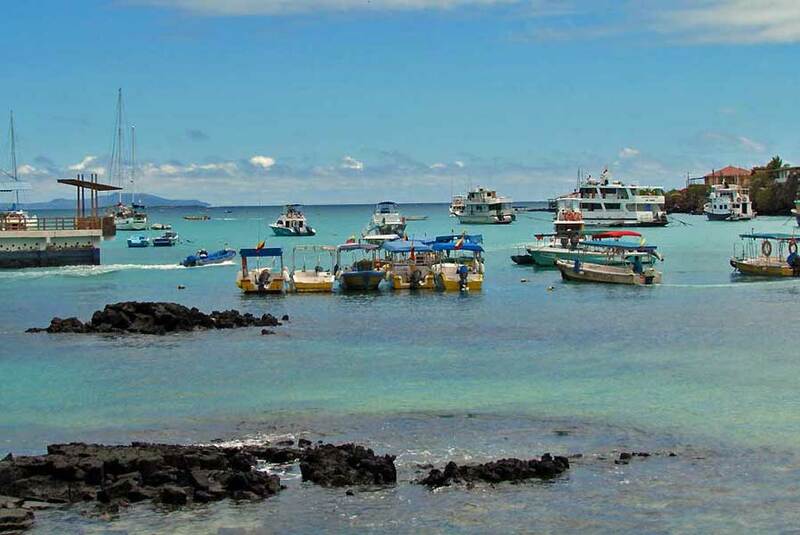 Puerto Ayora is the largest town in the Galapagos and the center for Galapagos tourism. Travel sales are a major source of revenue for the island. 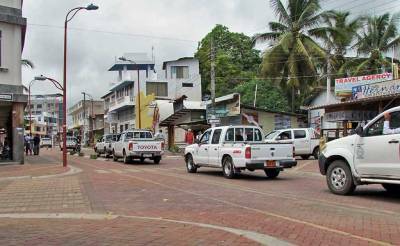 For reasons I never understood, nearly all the vehicles on the island are white four-door pickups. Access to Puerto Ayora is available by speed boat from San Cristobal. You can also reach Puerto Ayora by taking a free bus at the Baltra airport to an inexpensive, very short ferry ride to northern Santa Cruz. From the ferry landing it’s about a $20 US taxi ride (in 2012) to the other end of the island and Puerto Ayora. Puerto Ayora turned out to be a focal point for land based tours of the Galapagos. Local tour companies arrange excursions from Puerto Ayora to Santa Fe, Floreana, Isabela, Santiago and Bartolome. Multiple nights on Isabela can also be arranged. Restrictions prevent day trips to the island of Espanola. Book in advance, as last minute space may not be available. Diego, the Giant Tortoise, lives at the Research Station. 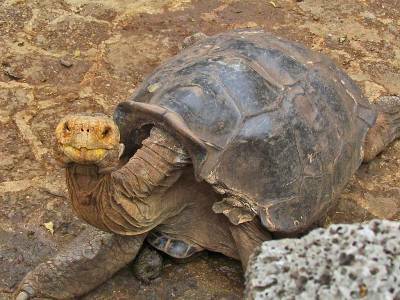 The Station is also the resting place of Lonesome George, the last tortoise of his species. 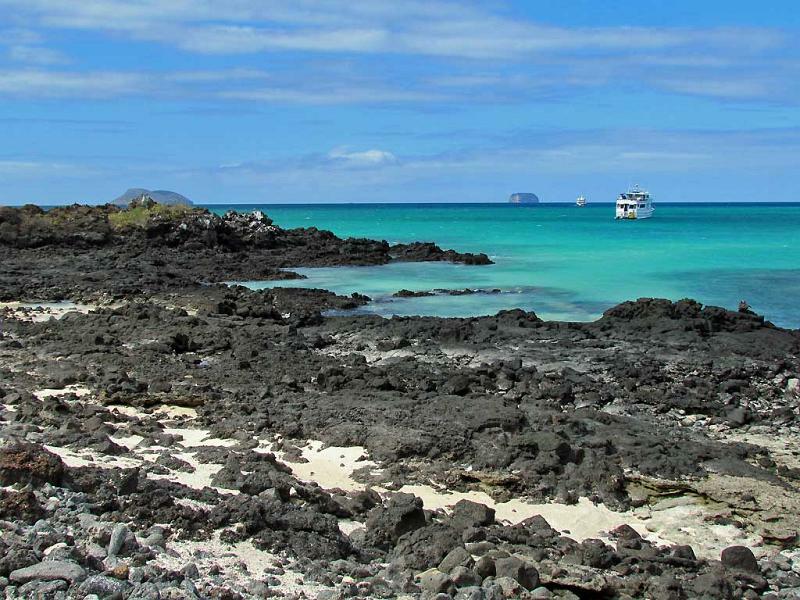 The Darwin Research Station is located within walking distance of Puerto Ayora. Very cute baby turtles were on display. The Research Station is committed to protecting and increasing populations Galapagos turtles and it raises many young ones. See the different shapes of turtle shells that evolution has created from different islands. The saddle back has a high arch, so the neck can extend upward to graze. Other species can’t do this and are flat or rounded over the neck. The highlight of my time on Santa Cruz Island was Tortuga Bay. The entrance station to Tortuga Bay is a couple blocks from the harbor in Puerto Ayora. You must register to enter, but there is no fee. The park closes at dusk and you must sign out when you leaved too. You need to walk 2 miles each way to get to the beach. A large section of the walk is a brick trail through the brush. The beach is amazing, so it’s surprising that there are almost no people there. Marine iguanas definitely out number people. Surfers risk the currents at the eastern edge. Swimming is forbidden in the western section. Turtles can sometimes be seen where the currents are the most dangerous. Large iguanas regularly cross the beach. Most of the iguanas are found at the western edge of the beach. Catch views to Santa Fe and Floreana Islands. There is also a small lagoon on the main beach where herons can be seen patiently waiting to catch tropical fish. At the western end of the beach, a right turn north leads to a sheltered bay where is it safe to swim and snorkel. Turtles can sometimes be spotted moving through the water. Kayaks were available for rent at unpredictable times. I took out a snack and an amazing array of birds will surrounded me. I tried to resist the urge to feed them, but they were too cute and too polite. When you leave Tortuga Bay, you have to sign out at the small registration office. They sell ice cold coca cola there, which make a refreshing end to a truly beautiful day. The Giant Tortoises in the fields at Rancho Primicias are the most popular attraction on the island. Small buses and vans take visitors from Puerto Ayora to the highlands to see them. Luckily the time of year was just right and the tortoises were out all over the fields. They are too slow to escape tourists but they don’t seem to even notice people. Touching these giants is discouraged. You definitely don’t want to get your hands near their mouths. Rubber boots were provided for walking through the wet fields. A smaller tortoise was in the way of the entrance to the boot room, so we all just stepped over and around it. The tour also included a visit to a lava tube. 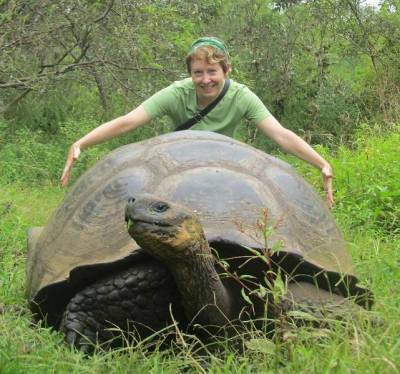 Don’t miss the chance to see the giant tortoises at Ranch Primicias. I also visited Bachas Bay at the north end of Santa Cruz Island. Green sea turtles nest on the beach here. The trails of mother turtles were etched in the sand of the beach, but there weren’t any turtles to be seen. Bachas Beach gets its name from two American World War II barges that washed up here from the former base on Baltra. The barges are now 99.9% buried in the sand on the beach. The local pronunciation changed from “barges” to “bachas”. 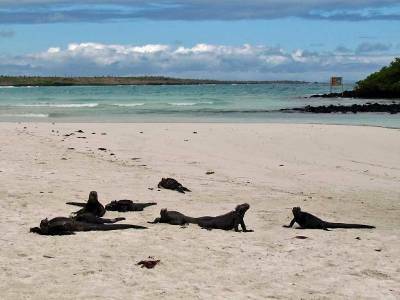 Not on my recommended list is the local Puerto Ayora tour to the Salt Flats, las Grietas, the shark bay, the iguana beach and a sea lion island. We did see lots of iguanas, but this tour isn’t up to the standard of the rest of the Galapagos. 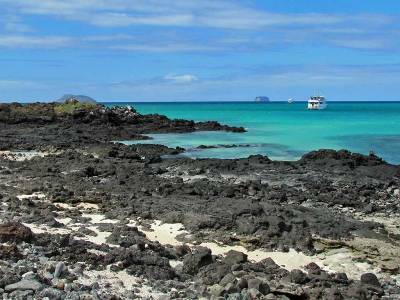 Take the no cost hike from Puerto Ayora to Tortuga Bay instead. 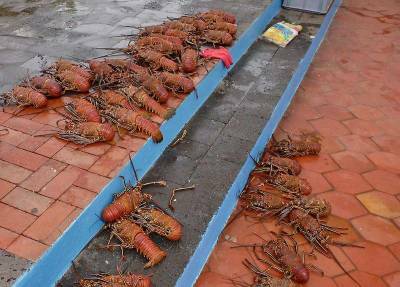 Another thing to do for free is to wander past the fish market near the Darwin Research Station. Birds and sea lions gather inside the open market to beg for scraps. The noise from screeching gulls and barking sea lions makes for chaotic entertainment. 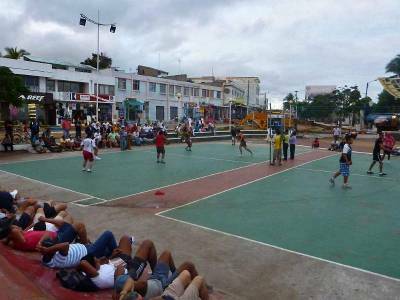 Ecua-Volley games happened almost every evening in Puerto Ayora. It’s an Ecuador style volleyball, where you can hold the ball a second and redirect it. For a tourist, it’s a very entertaining display. The hold and redirect move looks like blatant cheating to any traditional volley ball player. These nightly matches are serious matters for the players and many spectators. They gambled quite a bit of money on the outcome. The investment in the outcome creates some very excited spectators. The restaurant district was particularly enjoyable. Every night, the restaurants along Charles Binford Ave set tables in the street and cook over charcoal briquettes. A meal of rice, beans and tasty chicken was $5 in 2012. There is likely enough food to serve two in the single meal. Add an over-sized bottle of Pilsener beer and you will come it at under $8 total. Try chicken soaked in coca cola and slow roasted or try humitas – steamed corn cakes. From August to November lobster is served for about $22. They place the entire lobster directly on the table and you attack it with the small wooden hammer that’s provided. These are Galapagos lobster and they don’t have claws, so scientifically they are likely gigantic shrimp, the size of North American lobster. Eight months of the year it is illegal to harvest these, so I saw lots of people enjoying the last fresh ones at the end of November. After that the only way to enjoy lobster is from the freezer. Enjoy blue fin tuna and other seafood specialties at reasonable prices from Il Giardino on Charles Darwin Avenue. Not on my recommended list – Hernan’s on the waterfront is geared toward tourists. Wait until you return home to try a hamburger and stick to local fare on Charles Binford Ave.
Finch Bay Eco Hotel is top rated by Trip Advisor. This is luxury accommodation that comes with a luxury price.